​Sydney, 22 May 2013 – Sydney, Perth and Brisbane all rank in the global Top 10 list of cities with the most expensive prime logistics rents according to new research from CBRE. The Global Industrial View highlights that the wider Asia Pacific region dominates the Top 10 rankings, with Tokyo having retained its position as the world’s most expensive industrial market ahead of Singapore and Hong Kong at third and fifth place respectively. The quarterly survey shows that Brisbane is the highest ranked Pacific market in 7th place followed by Sydney in 8th position and Perth in 9th place. The research tracks rents across 55 markets on a $US per sq. ft. per annum basis. Tokyo was one of the few global logistics markets to see an increase in rents during Q1 2013 on the back of strong demand from third party logistics firms and internet retailers. Supply increased substantially in the city, but demand remained high due to a lack of suitable modern space. Greater Tokyo has already seen approximately 11 million sq. ft. of space introduced to the market in 2013 and many of these projects are of the most preferred occupier specifications - modern facilities of over 1 million sq. ft. of contiguous space. There was little change in the CBRE rankings by rent level relative to the previous quarter as many occupiers wait for clearer indications that global economic demand and trade to strengthen. In addition, availability for prime spaces with large floor plates is limited, leaving occupiers opting to consolidate with few viable options. 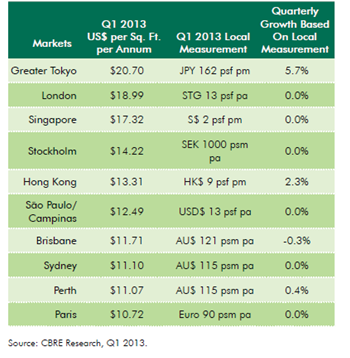 Hong Kong and Perth were the only cities to experience prime logistics rental growth in Q1 2013. CBRE Regional Director, Industrial & Logistics Services, Joshua Charles said tight availabilities in Perth had helped boost rent levels slightly (by 0.4% quarter-over-quarter). “While leasing activity was soft in Q1 the resource sector continues to drive demand for quality, large units from tenants associated with the liquefied natural gas sector,” Mr Charles said. 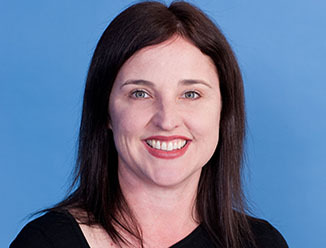 Rents across Brisbane remained stable over the quarter; however, upward pressure emerged for the best distribution facilities, driven by demand from the transport and logistics sector. Here too, availability rates remain low for quality properties. In Sydney, rent growth paused during the quarter however Mr Charles said this was less a result of demand conditions and more linked to supply-side dynamics. “Rents held steady in Sydney due to the restricted supply of high quality, well located stock,” Mr Charles said. The U.S. and Canada were noticeably absent from the rankings, which included just one Latin American market, São Paulo. Meanwhile, three Europe, Middle East and Africa (EMEA) markets - London, Stockholm and Paris - made the top 10. Ray Torto, Global Chief Economist, CBRE, commented: “Rents across the majority of the world’s most expensive logistics markets held steady again in Q1 2013 as third-party logistics operators and retailers continue to be primary sources of demand in markets such as Tokyo, where expansionary demand helped improve rents by 5.8% quarter-over-quarter. Pockets of growth were recorded for Hong Kong, and slightly for Perth, thanks to exceptionally tight availabilities of prime space.